The ultimate struggle for power pits men against kings and kings against gods. But the war between the gods themselves could destroy the world. Born of a god but raised as a man, Perseus (Sam Worthington) is helpless to save his family from Hades (Ralph Fiennes), vengeful god of the underworld. 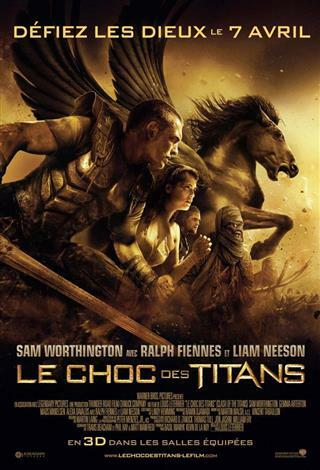 With nothing left to lose, Perseus volunteers to lead a dangerous mission to defeat Hades before he can seize power from Zeus (Liam Neeson) and unleash hell on earth. Leading a daring band of warriors, Perseus sets off on a perilous journey deep into forbidden worlds. Battling unholy demons and fearsome beasts, he will only survive if he can accept his power as a god, defy his fate and create his own destiny.